Chronic arsenicosis is a major health and occupational problem in rural parts of West Bengal such as in the parts of the Gangetic plain of India. Chronic arsenicosis occurs due to accidental ingestion of repeated amounts of small doses by those working with metal or by taking food or drink in which there are traces of arsenic. Sources of arsenic are ash, soil, water (20-100 m depth of subsoil water), some sea fish, and prawn. Chronic arsenic exposure may affect almost all systems of the body; but, major external cuteneous manifestations include palmar-plantar hyperkeratosis and rain drop pigmentation with arsenical punctate keratosis. Chronic exposure may result in hair nail and skin accumulation. Arsenic can also cross the placenta. Papillon-Lefèvre syndrome is a rare disease characterized by skin lesions caused by palmar-plantar hyperkeratosis and severe periodontal destruction involving both the primary and permanent dentitions. The sharply demarcated, erythematous keratotic plaques involve the entire surface of the palms and soles, sometimes extending onto the dorsal surface of the hands and feet. There may be associated hyperhidrosis of the palms and soles, which may cause a foul smell. The second major feature of Papillon-Lefèvre syndrome, severe periodontitis, starts at the age of 3 or 4 years. The development and eruption of the deciduous teeth proceeds normally, but their eruption is associated with severe gingival inflammation in the absence of any local etiologic factor. Until date, more than 200 cases have been reported worldwide. Palmoplantar hyperkeratosis is a major manifestation in both chronic arsenicosis and Papillon-Lefèvre syndrome. 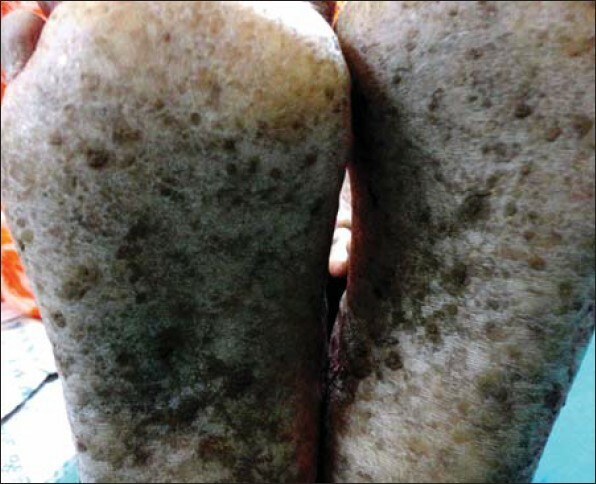 We report herein a rare case of chronic arsenicosis in a patient from rural Bengal, whose all features mimic Papillon-Lefèvre syndrome. It is probably the first case from India having Papillon-Lefevre syndrome - like presentation in chronic arsenicosis. A 20-year-old unmarried, young girl from the remote village of South Bengal, who had slightly poor physical but normal mental development, presented with occasional high rise of temperature, frequent dental caries, and fall-out of teeth from time to time since the age of 3-4 years along with persistent thickening, flaking, and scaling of the skin of her palms and soles for past 14 years. She also complained of poor formation of saliva (xerostomia), poor formation of tear (xerophthalmia), recurrent conjunctivitis, alopecia, frequent pharyngitis, otitis, rhinitis, and pyogenic skin lesions since childhood. The past dental history revealed that her deciduous teeth had erupted normally, but exfoliated gradually by the age of 4-6 years. Similarly, her permanent teeth too were lost prematurely after having erupted normally. At the age of 6 years, her parents had noticed the presence of rough skin on the plantar surface of her feet, with subsequent involvement of the palmar surface of the hands by the age of 9-10 years. The remainder of her past medical history was unremarkable. There was a family history of acquired palmoplantar keratodermas of her parents. She also informed that many of her neighbors of her locality had similar palmar-plantar hyperkeratosis without any other complaints she presented, particularly dental problems. On examination, there were symmetrical, well-demarcated, keratotic, and confluent plaques affecting the skin of the palms and soles [Figure 1] and [Figure 2]. The skin was dry and rough on palpation. She also had chronic eczematous dermatitis in elbows and knees, few areas of hypo/hyper-pigmentation of anterior and posterior part of the chest. Her hair was sparse, fine, and lusterless, brittle along with alopecia; she also had decreased body hair and sparse or absent eyebrows and eyelashes. On intraoral examination, it was found that patient's central incisors, mandibular lateral incisors, maxillary first premolars, and all permanent first molars were missing [Figure 3]. All permanent teeth that were present exhibited marked mobility and were malformed, rudimentary, and conical or pegged teeth. Enamel defects were present with dental caries. Detailed physical and systemic examinations were unremarkable, except for mild to moderate pallor. Routine hematological examinations and routine biochemical examinations revealed normal results, except for anemia. Serological tests like anti-nuclear antibody, anti-cytoplasmic neutrophilic antibody, HIV-I and II, and VDRL were negative. Chest X-ray posterior-anterior view was within normal limit. Orthopantomonograph (OPG) of the patient showed severe alveolar bone loss in relation to the existing permanent teeth up to the level of apical third of roots, giving the teeth a "floating in air" appearance. At this point, we made a clinical provisional diagnosis of Papillon-Lefevre syndrome, with a possible differential diagnosis of chronic arsenicosis. All the clinical features were in favor of Papillon-Lefevre syndrome, except for those that were similar palmo-plantar hyperkeratotic lesions of her parents and of few neighbors. Histopathology of skin lesions was not done as her parents declined a biopsy. To rule out chronic arsenicosis, we decided to send her hair and nail for estimation of arsenic level by neutron activation analysis at our own costs as she was from a poor family. Neutron activation analysis of hair and nail proved the diagnosis of chronic arsenicosis. She and her parents and affected neighbors were advised to change the source of drinking water. She was initiated with a standard dose of penicillamine as a chelating agent and was referred to a dermatologist for treatment of palmo-planter hyperkeratosis. Papillon-Lefèvre syndrome, first described by two French physicians Papillon and Lefèvere in 1924, is an extremely rare genodermatosis inherited as an autosomal recessive trait, affecting children between the ages 1-4 years. It has a prevalence of 1-4 cases per million persons. The disorder is characterized by diffuse palmo-plantar hyperkeratosis and premature loss of both deciduous and permanent teeth. The palmo-plantar hyperkeratosis typically has its onset between the age of 1 and 4 years. The sharply demarcated hyperkeratotic plaques may occur focally, but usually involve the entire surface of the palms and soles, sometimes extending onto the dorsal surfaces of the hands and feet. Often, there is associated hyperhidrosis of the palms and soles resulting in a foul-smelling odor. Well-demarcated psoriasiform plaques occur on the elbows and knees. The second major manifestation of Papillon-Lefèvre syndrome is severe periodontitis, which starts at the age of 3 or 4 years. ,, The development and eruption of the deciduous teeth proceed normally, but their eruption is associated with gingival inflammation and subsequent rapid destruction of the periodontium. , However, with the eruption of the permanent dentition, the process of gingivitis and periodontitis is usually repeated and there is subsequent premature exfoliation of the permanent teeth, although the third molars are sometimes spared. ,, Nail changes are apparent in advanced cases, as in this case, and manifested by transverse grooving and fissuring. In addition to the skin and oral findings, patients may have immune suppression and an increased susceptibility to bacteria, associated with recurrent pyogenic infections of the skin. Papillon-Lefèvre syndrome is caused by loss-of-function mutations affecting both the alleles of the cathepsin-C gene, located on chromosome 11q14.1-q14.3. The skin manifestations of Papillon-Lefèvre syndrome are treated with emollients, with salicylic acid and urea added to enhance the effect. Oral retinoids including acitretin, etretinate, and isotretinoin are the mainstay of treatment of both the keratoderma and the periodontitis associated with Papillon-Lefèvre syndrome. ,, Treatment is more beneficial if it is started during the eruption and maintained during the development of permanent teeth. Frequent periodontal cleaning, oral hygiene instruction, and antibiotic therapy can, at best, only delay the shedding of teeth. Chronic arsenicosis is a major health and occupational problem in parts of rural West Bengal, as in the parts of the Gangetic plain of India. High levels of arsenic in the subsoil water has been reported from all over the world, and globally many areas with as high a content have been identified by the WHO. These include areas surrounded by The Great Ganga Basin in India, where 25% of the wells have been found to such a high content, as reported by WHO. Arsenic is a both organic and non-organic metal. Its compounds include arsenic trioxide (As2O3), arsenic pentaoxide (As2O5), arsine (AsH3), copper arsenite (CuAs), arsenic trisulfide, and arsenic bisulfide. Chronic arsenicosis occurs due to accidental ingestion of repeated amounts of small doses by those working with metal or by taking food or drink in which there are traces of arsenic. Sources of arsenic are ash, soil, water 20-100 m depth of subsoil water, some sea fish, and prawn. Tobacco smokes also contain arsenic. Arsenic is mainly absorbed from the gastrointestinal (GI) tract, but gaseous arsenic is absorbed by the lung. Arsenic concentrates mainly in the liver, kidney, skin, lung, bone, and muscles. Non-specific symptoms like easy fatigability, malaise, lack of interest and concentration, pain in joint, constipation and loose motion, loss of weight, vomiting, and sensory and motor polyneuritis are some systemic manifestation. , Chronic arsenic exposure may affect almost all systems of the body, but major external cuteneous manifestations include palmar-plantar hyperkeratosis and "rain drop pigmentation" with arsenical punctate keratosis. ,, Chronic exposure may result in its accumulation in the hair, nail, and skin. Lung carcinoma, lung fibrosis, Bowen's disease of sole, and squamous cell carcinoma of skin have also been reported in some cases. Arsenic can also cross the placenta. Blood levels are not a good indicator of exposure level due to its short half-life. Major amount was excreted via urine (80%) and feces (10%). Chronic arsenicosis is diagnosed by neutron activation analysis of hair or nail sample, where more than 75 μg% in hair and/or more than 100 μg% in nail confirm diagnosis. , The source of poisoning should be identified and further exposure should be avoided. According to WHO guidelines, levels of arsenic in drinking water should not exceed 10 μg/L. In areas where the drinking water supply contains unsafe levels of arsenic, the immediate concern is finding a safe source of drinking water. There are three main options for this: (1) Finding a new source, (2) increasing the depth of tubewell to more than 100 m, and (3) removing arsenic from the contaminated source. In our present case, all the clinical features of the patient were in favor of Papillon-Lefevre syndrome, except for those similar to palmo-plantar hyperkeratotic lesions of her parents and of few neighbors who were in favor of chronic arsenicosis. Neutron activation analysis of nail and hail confirmed chronic arsenic exposure. However, in our case, genetic testing could not be performed to identify the gene mutation of cathepsin-C because of the low economic status of the parents, but the dermatological, periodontal, and radiological features strongly suggested the diagnosis of Papillon-Lefevre syndrome. Therefore, we concluded from this rare case that (1) this may be a rare Papillon-Lefevre syndrome-like presentation of chronic arsenicosis or (2) chronic arsenic exposure (transplacental and her life-time exposure) may cause mutation of Cathepsin-C gene expressed as Papillon-Lefevre syndrome. Further research is required to identify the truth regarding second theoretical possibility. 1. Rahman MM, Chowdhury UK, Mukherjee SC, Mondal BK, Paul K, Lodh D, et al. Chronic arsenic toxicity in Bangladesh and West Bengal, India-a review and commentary. J Toxicol Clin Toxicol 2001;39:683-700. 2. Sengupta SR, Das NK, Datta PK. Pathogenesis, clinical features and pathology of chronic arsenicosis. Indian J Dermatol Venereol Leprol 2008;74:559-70. 3. Nagaveni NB, Suma R, Shashikiran ND, Subba Reddy VV. Papillon-Lefevre syndrome: Report of two cases in the same family. J Indian Soc Pedod Prev Dent 2008;26:78-81. 4. Bergman R, Friedman-Birnbaum R. Papillon-Lefèvre syndrome: A study of the long-term clinical course of recurrent pyogenic infections and the effects of etretinate treatment. Br J Dermatol 1988;119:731-6. 5. Anuradha S, Agarwal SK, Singh NP, Gupta A, Chowdhury V. J Assoc Physicians India 2002;50:974-6. 6. Janjua SA, Khachemoune A. Papillon-Lefevre syndrome: Case report and review of the literature. Dermatol Online J 2004;10:13. 7. Hart TC, Hart PS, Bowden DW, Michalec MD, Callison SA, Walker SJ, et al. Mutations of the cathepsin C gene is responsible for Papillon-Lefèvre syndrome. J Med Genet 1999;36:881-7. 8. 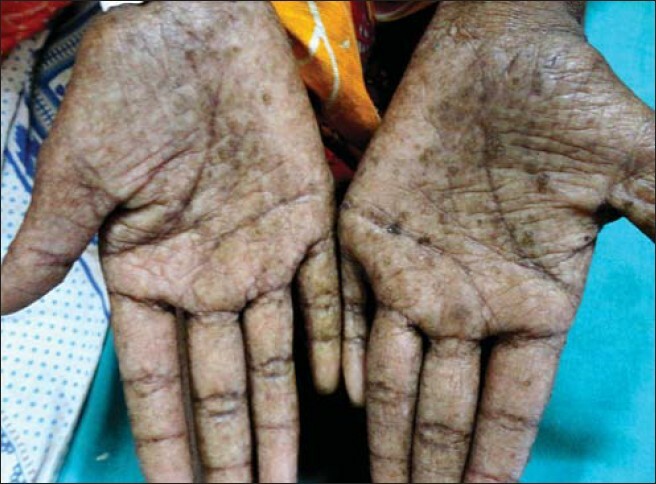 Mandal NK, Biswas R. A study on arsenical dermatosis in rural community of West Bengal. Indian J Public Health 2004;48:30-3.